The ePassport testing lab, FIME, has certified Atmel’s AT90SC12872RCFT secure microcontroller is compliant with ICAO and ISO 14443 specs. FIME, a key player in today’s ePassport test market, recently announced a new ePassport test bench for ISO 14443 and ICAO specifications compliance testing applying ISO 10373 test methods for RFID (radio frequency identification) cards. Trusted independent laboratory recognized worldwide for its expertise in component evaluation related to contactless applications, FIME has issued a report for a silicon manufacturer, certifying that its AT90SC12872RCFT secure microcontroller is compliant with ICAO (International Civil Aviation Organization) and ISO 14443 specifications (Contactless Interface for smart card). This is a world first in the industry. 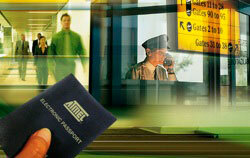 Xavier Giandominici, Business Development Manager for FIME stated, “Atmel’s AT90SC12872RCFT secure microcontroller was successfully qualified in FIME’s new ePassport test environment under the ISO and ICAO compliance specifications. To ensure compliance under extreme conditions, FIME, with its new test environment, undertakes compliance testing in different temperature environments and at different data transfer rates; temperatures ranging from minus 10°C, room temperature to 50°C – and communications speeds of 106, 212, 424 and 848 kbps. FIME offers a complete range of test services for ePassport applications including Layers A and 1 to 7 under the ICAO specifications. FIME distributes qualified ePassport test benches and supports its worldwide customers from the initial product specification to the commercial launch.